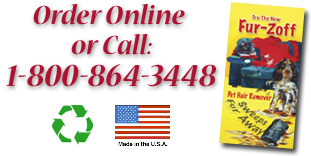 "I ordered 2 Fur-Zoff three months ago and they are still working fine. Your product is the greatest hair removal item I have ever used and I count it as a miracle in my 2 dog household. The first couple of weeks after I got them, I worked on every carpet in the house. I couldn't believe the amount of dog hair that I ended up with!!! My 2 year old granddaughter sits with one and "helps" me so it's a fun "bonding" experience we share as she doesn't know it's work! I was just so frustrated with all the dog hair on my carpets and rugs that I went on the internet one day and read numerous ads. I had tried just about everything and the items tended to be expensive and/or just plain didn't work. Thank you for making the Fur-Zoff and I am positive I will be ordering more in the future." "I run a canine search and rescue team and have search dogs in my vehicle all the time. When I saw how fast and easily the Fur-Zoff cleared the hair out of the back of my Suburban I had to have one." "I have a weight belt which attaches by Velcro to my ankle so I can do leg lifts. Over the years the Velcro became so clogged full of lint and pet hair it wouldn't remain closed, so the belt kept falling off. I stroked it with my Fur-Zoff, and it cleaned right up in a few minutes and holds tight again." "Dressing for a holiday party I pulled out my full length crushed velvet party dress and found it covered in lint and other dusty closet things. I started trying to clean it with tape but it just wasn’t working. Then I remembered the Fur-Zoff. I took one giant sweep down the dress and it was like a snow plow through freshly fallen snow! The dress was ready to wear in a few minutes! WOW! Now I keep my Fur-Zoff on the closet shelf ready at all times. Thanks for a great product." "Once I had my own home to clean, I noticed how much fur my loving pets left behind on my furniture, bedding, and car seats. I tried Fur-Zoff on my down comforter and was blown away! I could not believe my eyes when I cleaned both sides of a very furry comforter in 5 minutes or less." "Just a quick note in regards to Fur-Zoff. We have a dog and cat in our house and pet hair usually clings to our micro-fiber sofa. I used Fur-Zoff as you had instructed, long easy strokes, and it worked excellent. The key is not to push hard and to continue the long strokes. We will be using your product now rather than the role of tape or the vacuum cleaner we had been using." 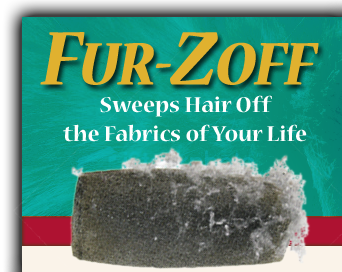 Lifetime Guarantee – Every Fur-Zoff is backed by our 100% Unconditional, Lifetime Guarantee. If for any reason you are not satisfied with Fur-Zoff and want to return it, simply contact us at info@furzoff.net and we will refund your purchase price. So go ahead and give Fur-Zoff a try. We know you are going to love it.